Supercharging of internal combustion engines has been used for many years as a method to improve engine performance and efficiency. Entering the millennium, a new trend is appearing. The trend points to small displacement engines in order to meet federal emission legislation on fuel consumption and emission control. The driver, however, still demands the same performance they're used to. A good way to meet these needs is supercharging otherwise known as forced induction. The purpose of supercharging an engine is to raise the density of the air charge, before it's delivered to the cylinders. Thus, the increased mass of air trapped and then compressed in each cylinder during each induction and compression stroke makes more oxygen available for combustion than the conventional method of drawing the fresh air charge into the cylinder (naturally aspirated). Consequently, more air and fuel per cycle will be forced into the cylinder, and this can be efficiently burnt during the combustion process to raise the engine power output to higher than would otherwise be possible. Generally, there are three basic types of "superchargers," the most popular being the exhaust-gas driven turbocharger, mechanically driven superchargers and the pressure-wave supercharger. The mechanically driven supercharger is broken up into two groups as well, the mechanically driven centrifugal supercharger and the mechanically-driven positive displacement supercharger such as the screw-type and roots-type. In automotive and marine applications, the pressure-wave supercharger is rarely used. The turbo and roots-type superchargers have been the most popular forced induction methods in the past. While the turbo creates great peak horsepower, turbo lag and high cold start emissions due to the thermal mass are severe drawbacks of the turbocharger. Small displacement engines need higher-pressure ratios to achieve the performance demanded by the driver. This fact increases the mentioned drawbacks of the turbo and makes the turbocharger a less desirable alternative for supercharging than the mechanical twin-screw supercharger. The Whipple twin-screw charger does not have the usual drawbacks of earlier mechanical superchargers such as the roots-type, such as poor efficiency especially at high-pressure ratios, high rpm, high noise level as well as high price. Comparative tests, made independently by Whipple Industries, show that the twin-screw compressor is the most effective supercharging method available. 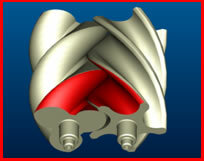 A screw compressor is a positive displacement machine that uses a pair of intermeshing rotors to produce compression. The rotors comprise of helical lobes affixed to a front and rear shaft. One rotor is called the male rotor and it will typically have three bulbous lobes. The other rotor is the female rotor and this has valleys machined into it that match the curvature of the male lobes. Typically the female rotor will have five valleys. The rotors never touch, but are timed by a pair of gears operating in a lubricated chamber, which is separated from the rotor chamber. With the 3-5 rotor combination, the male rotor turns 1.66 times to every one time of the female rotor. The number of lobes on the male and female rotor will vary from one compressor manufacturer to another. However, the female rotor will always have numerically more valleys that the male rotor has lobes. Because of the number of male lobes, there are three compression cycles per revolution, which means that the resulting compressed air has small pulsations compared to a reciprocating compressor. By the time that the compressed air leaves the package, it is to all intents and purposes pulsation free. Heinrich Krigar in Germany on March 24th, 1878, patent #4121, first patented the principle of the screw compressor. He modified and improved his designs later that year and lodged a second patent (number 7116) on August 16th, 1878. Both of these patents are amongst the earliest on record, as the German Patent Office had only been formed just one year earlier. Heinrich Krigar resided in Hannover and his illustrations clearly show a two-lobe rotor assembly, each rotor having the same profile as each other. In fact the rotor configuration resembles the Roots design, exhibited in Europe during 1867, with the exception that the rotors in the Krigar screw compressor twist through an angle of 180 deg along their length. At that time it was not possible to develop the idea any further because of the lack of manufacturing technology. Half a century later, a Swedish steam turbine manufacturer called Ljungstroms Angturbin AB appointed a new Chief Engineer, his name was Alf Lysholm and he was to be the pivotal in the development of the modern screw compressor. At that time, Lysholm was looking into lightweight compressors for gas and steam turbine use. By this time the original patent rights had expired. Lysholm developed the profile of the screw compressor and tested various configurations and rotor lobe combinations. Not only was the shape of the rotors important, he solved the problem and patented the method for accurately machining the rotors. The 1935 patent clearly shows his asymmetric 5 female - 4 male lobe rotor design, although the shapes have been 'fine tuned' over the years, the screw compressor had at last been born. Ljungstroms Angturbin AB changed its name to Svenska Rotor Maskiner AB in 1951. This company is well known throughout the world as SRM, and has issued manufacturing licensees to almost every screw compressor manufacturer that exists today. When did the screw compressor reach the automotive market? 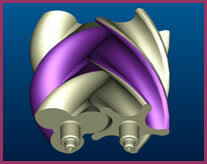 In the early 80’s, Sprintex used some out of patent Lysholm rotor designs to create one of the first twin-screw superchargers. The results were very promising, both parasitic losses and discharge temperatures were far superior to other positive displacement superchargers. Some of its first units were produced in the early 1980’s but manufacturing was still very expensive which hampered its marketability. In 1988, Art Whipple of Whipple Superchargers felt the little known “screw-type” supercharger had superior efficiency and was certainly the supercharger for the future. Whipple became the first North American Company to utilize the screw compressor for a production supercharger kit, but again, manufacturing cost hampered its true marketability. Whipple also found that compressor size was a problem. The original units were designed for smaller engines of Europe, the US market needed larger compressors with more airflow capacity. In 1990, SRM formed a sister company named Opcon Autorotor. This company was formed specifically to develop twin-screw compressors for use on internal combustion engine applications. With the vast knowledge and history of SRM, Autorotor used a later generation D-profile rotor design. By 1991, Autorotor signed an exclusive agreement with Art Whipple of Whipple Industries, which had already been producing supercharger systems using the Sprintex supercharger. This relationship was a tremendous success and quickly helped put the screw compressor in the automotive market. By 1992, the Autorotor compressor had adopted the name “Whipple Charger” which is still used today. In the early 90’s Whipple Superchargers was over-burdened with building “systems” that they decided to only concentrate on General Motor vehicles. Whipple then agreed to supply Kenne Bell the “Whipple Charger” compressors for use on Ford applications. In 1995, Opcon Autorotor went through some difficult times and split from SRM. newsupercharger company named Lysholm Technologies after the original chief engineer of SRM, Mr. Alf Lysholm. This company was formed to create a true OEM quality twin-screw compressor for internal combustion engines. In 1999, Lysholm Technologies formed a partnership with Eaton Corporation for the OEM rights. This allowed Lysholm Technologies to adapt some of the same mechanical principles that was so successful and proven with the Eaton roots-type superchargers. At this time, the screw compressor was being prepared for mass production for future OEM quantity levels. This joint venture increased the reliability and durability as well as validating the screw compressor technology but took years for it to reach the OEM level. It wasn’t until 2004 that Lysholm begin delivering their first true OEM application via Eaton Corporation for the famed Ford GT super car. In 2004, Lysholm Technologies and the Opcon Group merged, in hope of combining forces and taking the screw compressor to the next level of high volume production. Although this seemed good on paper, this created issues with delivery to the aftermarket distributors. The last quarter of 2004 and first two quarters of 2005 showed very little production of twin-screw compressors through Lysholm Technologies. This put a tremendous strain on the world’s largest aftermarket twin-screw compressor distributor, Whipple Industries. Due to the lack of delivery and sever back order level, Whipple Superchargers began development of their own line of superchargers. With their extensive knowledge and years of experience, Whipple developed an entirely new supercharger lineup that featured all of the latest technology in rotor profile, housing, rotor coating and bearing design. The results were astounding, not only did production begin in the USA, Whipple also increased compressor efficiency, lowered overall noise level, increased reliability, engineered the ability to update and repair (some are non-repairable) and increased it’s durability for a wider variety of applications. Dyno proven to produce more horsepower and torque than any other supercharger throughout the entire rpm range. Our relentless commitment to creating products that exceed the cutting edge of design, performance and quality has given us the reputation as innovators and leaders in the high performance industry. Every Whipple product goes through extensive research and development to ensure proper operation in all applications. Our standard development practice involves the measurement of over 100 parameters utilizing our own custom designed data acquisition computers. Measurements include individual cylinder air/fuel ratio from a true wide range Horiba sensor, individual cylinder pressure and cylinder combustion analysis as well as solid-state exhaust gas temperature. Our expert calibration team has over 15 years of OEM experience calibrating the most stringent emission standards such as Super Ultra Low Emission Vehicles (SULEV) and Zero Emission Vehicles (PZEV). No other supercharger company has a more advanced staff in computer technology and emsission friendly products. Every product gets extensive R&D time on either our DynoJet Chassis dyno, our Superflow engine dyno or our Land & Sea propshaft dyno. This ensures that you get maximum power from our product and long, trouble free operation. Awesome idle-to-redline rpm power. No lag. Poor low-speed response, similar to "turbo lag." Poor low-speed response. Turbo lag. Good low to mid range power. Increased lugging ability in higher gears. Increased power throughout rpm range. Must downshift to maintain boost level. Increased lugging ability in higher gears. Virtually flat curve; ideal characteristic. Often worse than uncharged engine at low speeds. Wide range; fall-off can occur at high speeds. Low; intercoolers are usually not needed. If you’re interested in building your own supercharger packages for kit to resale to the general public, there is no better supercharger than a Whipple Twin Screw Compressor. OEM manufactures utilize positive displacement superchargers due to their incredible throttle response and drive-ability of a big cubic inch motor. When building a system for the consumers, you must provide a very broad power ban with a high peak horsepower level, only the screw compressor can give you this. This is due to the high adiabatic (up to 80%) and volumetric efficiency levels (up to 99.9%). The Whipple screw compressor is the latest generation, durable and dependable performance-enhancing item ever designed for either low boost or high boost levels. Available in a complete unit or a “rotor assembly” for builders own housings. The screw compressor is by far the best supercharger available today; it’s the only supercharger to provide a positive displacement design for maximum low-end torque as well as high efficiency for maximum top-end horsepower. No other supercharger in the world can offer the same unique benefits. 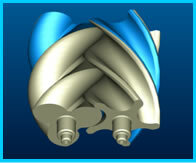 Centrifugals and turbos have tremendous lag time during shift points, on-off throttle and off the line boost. 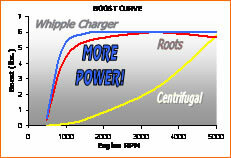 Roots-type superchargers have been proven to not be very efficient, especially at higher boost levels. Whipple Superchargers has a variety of screw compressors for all types of applications, anywhere from a 100 cubic inch compressor to the 510 cubic inch compressor. Whipple also has a wide assortment of drive lengths, pulley combinations and bypass valves for all types of applications. Comparison data shows a significant improvement (W140ax-Green) vs. the previous generation 2.3 liter (Blue) on back-to-back testing. Superior noise level in comparison to previous design, virtually noise free operation. High flow rotor coating for increased efficiency and increased durability. Increased bearing lubrication for lower operating temps and increased durability. Serviceable supercharger, replaceable and upgradeable component design. More robust design, double angular front bearing and sealed roller rear bearing for improved reliability. Oil sight glass for proper oil level inspection. 100,000 mile oil change intervals. Response Awesome idle-to-redline rpm power. No lag. Poor low-speed response, similar to "turbo lag." Poor low-speed response. Turbo lag. Good low to mid range power. Driveability Increased lugging ability in higher gears. Increased power throughout rpm range. Must downshift to maintain boost level. Must downshift to maintain boost level. Increased lugging ability in higher gears. Heat Buildup Low; intercoolers are usually not needed. Low; intercoolers are usually not needed. High; may need intercooler High; limits boost available. Noise Very low noise levels. Typically very noisy. Very low noise levels. Typically very noisy.